What a difference! Restore discolored, worn, stained, cracked or chipped teeth to their genuine state of beauty. Correct open spaces between teeth for an irresistible smile. Porcelain veneers and laminates are strong, durable, stain-resistant and long-lasting. Procedure: Teeth Whitening Followed by Porcelain Veneers. Not every smile is born perfect and not many stay that way over time. If you’d love to have a natural-looking, attractive smile, veneers are good choice. Veneers restore the natural beauty of teeth that show yellowing, decay, chipping, breakage, wear or abrasion or imperfect development. People truly appreciate veneers, because they look so much like natural teeth, just amazingly attractive and resist stains from coffee, tea, red wine and cigarette smoke. Veneers are thin but strong shells of porcelain that are permanently bonded to the tooth’s surface. Crafted of high-tech and highly aesthetic porcelain, they are applied with a strong resin adhesive. These custom-made moldings cover the front of your teeth and match your natural tooth color. The finished result is extremely strong, durable, and appealing. To make your customized veneers, Dr. Salee prepares your teeth by removing a small amount, usually .5 to 1 mm of enamel at most. 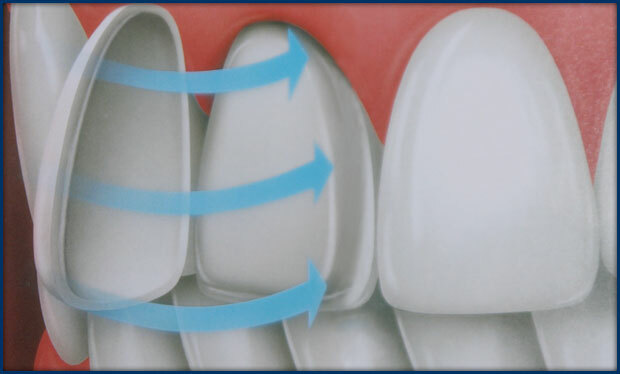 In space-closing cases, no enamel needs to be removed to achieve an optimum result. Dr. Salee then takes an impression of your teeth. Your impression is then sent to a premium dental lab that specializes in highly aesthetic dental veneers. Dr. Salee has done extensive research to find the highest quality labs and technicians in the country. When ready, Dr. Salee applies the veneers. The procedure can take as few as two appointments. Fillings, Crowns or Veneers What’s Best When? However, they last longer when you care for them properly. Regular oral hygiene is important. Avoid bad habits it’s best not to bite nails, chew on bones or ice, or open nut shells with your teeth. Visit us regularly for routine cleanings and exams. Caring for your teeth helps ensure that your veneers last long into the future, looking perfectly stunning.